Öppet tisdagar kl 09-12 och söndagar kl 11-16, med reservation för vissa helgdagar. Gratis inträde vid ordinarie öppethållning. Grupper enligt överenskommelse. 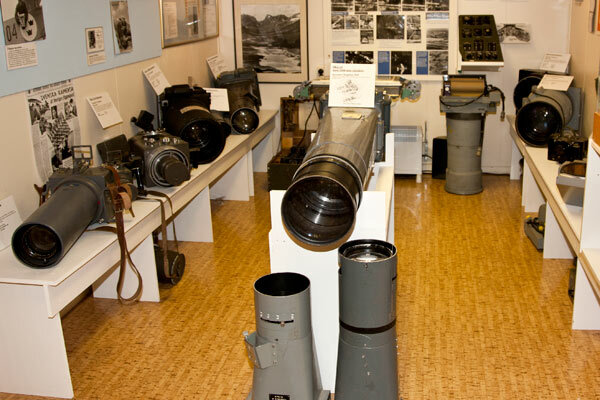 The F11 Museum was inaugurated on the 15 October 1991, fifty years to the day after the air wing itself was inaugurated in 1941, and ten years after its closure in 1980. The Museum's pictures and exhibits reflect the almost 40-year-long F11 era. F11 was the country's only pure reconnaissance wing and the bulk of modern reconnaissance technology and tactics was developed here. During the wing's heyday 900 or so people served here, and over the years more than 15,000 young men did their national service with F11. Following the formation of the Nyköping Aviation Association, more and more items have reached the museum from other activityin the region. The friendly atmosphere at the F11 Museum has been praised by many. From the Museum, which is the highest point of the area, there is a fine view over Stockholm Skavsta Airport. One of the Museum's aims is to provide snapshots of everyday life from the whole of the F11 era: the various planes, the intelligence service, the work of the mechanics, life off duty, the sickbay, sport, the smart uniforms worn over the years, and last, but not least, overalls for both fliers and groundstaff. As more items come in from other activity in the region, these will also be put on show. A Nyge Aeros Sparven and a Bulldog (Beagle/Scottish Aviation) from the army have been added to the collections and are now on show in the hangar. 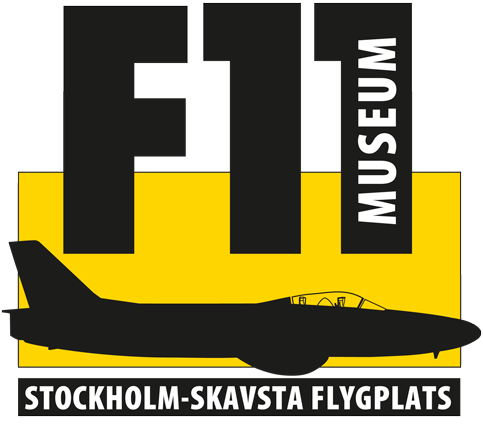 The body responsible for the F11 Museum is the Nyköping Aviation Association. The Association is open for anyone to join for an annual subscription of SEK 200 (under 18s SEK 100). The F11 Museum is run by volunteers and exists only thanks to generous sponsorship and donations. The Museum is run, maintained and developed by a steadfast team of talented enthusiasts. The attractive S32C is the result of 4000 hours of voluntary work by the talented group of mechanics. Our little shop sells literature about planes and other items, such as our attractive pictures of Spitfires and S18s. Welcome tuesdays 09–12, sundays 11-16. Guided tours for large groups by arrangement. Visits during normal opening hours free of charge. For pre-booked group visits, SEK 30 per person. Minimum charge SEK 250. The airport is signposted from the E4, and local roads 52 and 53. 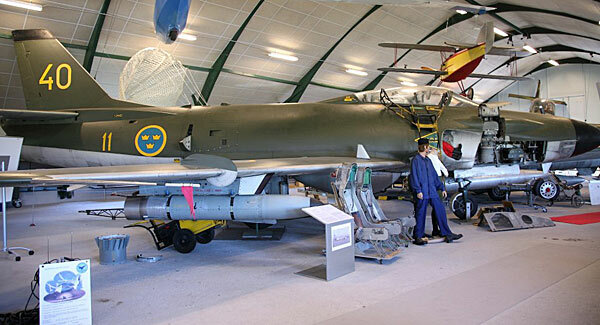 The F11 Museum is owned by Nyköping Aviation Association. Air reconnaissance consists of various activities: photography, radar, interpreting images, etc. Technological progress, from hand-held cameras with glass slides to modern, fixed, automatic cameras, is clearly illustrated at the Museum. You can try your own hand at interpreting images using a stereoscope. Our intelligence platoon will give you an insight into modern air reconnaissance and image interpretation with IT support. The last reconnaissance plane used by F11 was the S35E Draken ("The Dragon"). The S35 was first used by F11 in 1965 and flew for the last time in 1979. 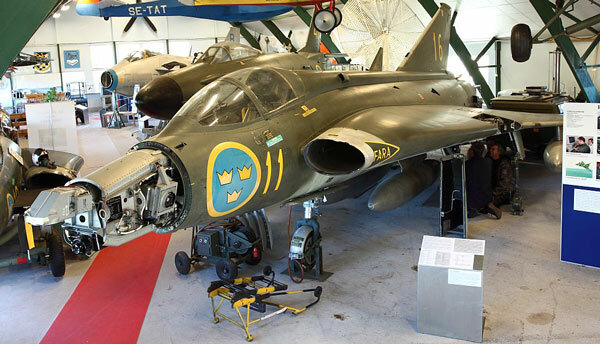 An S35 Draken is still on view today at the Museum, together with an S32 Lansen ("The Lance") and an S29 Tunnan (The "Barrel"). 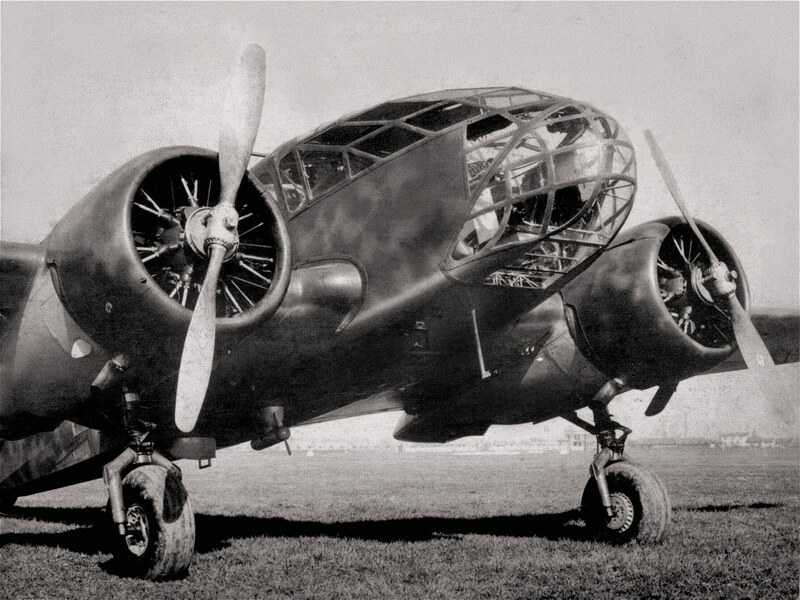 The S16 Caproni was the wing's first reconnaissance aircraft. The plane had its faults, which were remedied, after which the plane played an exceptional role in Sweden's defence during the war years 1942-45. In addition to the engine and other aircraft components, the Museum's fine model collection has an S16. 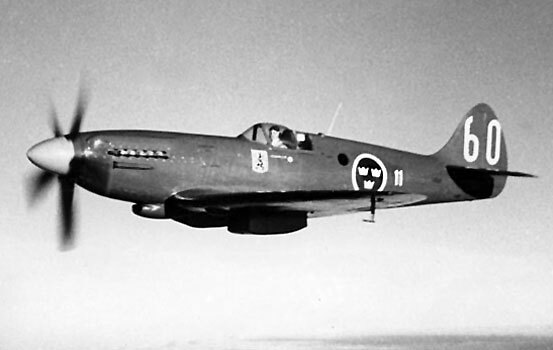 F11 was the only Swedish wing to have Spitfires, famous from the Battle of Britain. F11 had fifty S31s from 1948 to 1955. The development of modern reconnaissance aircraft began with the S31. The plan's imposing propeller, 3.18 meters in diameter, has been sited on the north wall of the hangar. The attractive S32C is the result of 4000 hours of voluntary work by the talented group of mechanics.